316 pages | 10 B/W Illus. In the 21st century governments are increasingly focusing on designing ways and means of connecting across boundaries to achieve goals. Whether issues are complex and challenging – climate change, international terrorism, intergenerational poverty– or more straightforward - provision of a single point of entry to government or delivering integrated public services - practitioners and scholars increasingly advocate the use of approaches which require connections across various boundaries, be they organizational, jurisdictional or sectorial. What do we mean by the notion of crossing boundaries? What does cross boundary working involve? What are the critical enablers and barriers? By scrutinizing these questions, the contributing authors examine: the promise; the barriers; the enablers; the enduring tensions; and the potential solutions to cross-boundary working. As such, this will be an essential read for all those involved with public administration, management and policy. This book’s critical examination of crossing boundaries—organizational, jurisdictional, sectoral, international—is vital reading for those unsatisfied with typical discussions of collaboration and network management. The questions addressed in this volume demonstrate that overcoming such boundaries is the signature governing issue of our time. A rich and satisfying collection that rewards the continuing policy and scholarly interest in the theory and practice of cross boundary working by drawing on international experiences, detailed cases and innovative methods to offer new insights on fundamental questions. 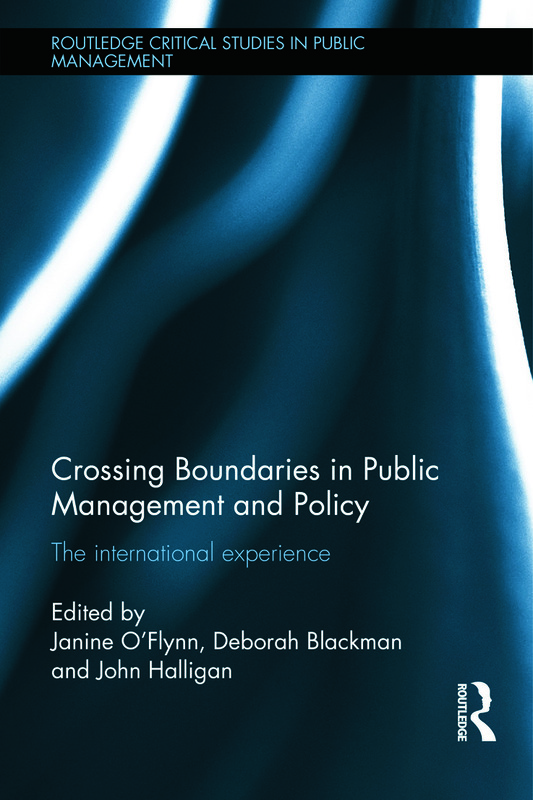 This book assembles a diverse and inter-disciplinary set of contributions highlighting the importance of ‘boundaries’ as sites of ambiguity, conflict and potential in the theory and practice of international public policy and management. It represents a valuable and thought-provoking addition to the existing literature on this important subject.